It has recently come to my attention that I am a hoarder of olives (and craft ribbon, but that’s a whole other story). As I was standing in front of the fridge pondering what to make for dinner, I realized there were no less than four full and unopened containers of various types of olives – you know, the kind from the olive bar in the supermarket. Also, there were multiple cans in the pantry which got me to thinking, “Why do I buy some types of olives from the deli but others are just fine from a can?” There was no time to get into a full analysis; the bottom line was, I needed to start working my way through all the olive supply. This recipe knocked out about half a container so it’s a start. And then I discovered three containers of feta in the cheese drawer. I guess it’s called the cheese drawer – that narrow drawer just under the shelves but above the freezer …. what do you call it? Anyway, this dish was delicious! And with the olives, feta, capers, tomatoes… this pasta, full of the briny goodness I love, made for an impressive presentation. I use big pasta bowls and this recipe yielded three good-size servings. Make it vegan by omitting the feta or swapping it for a tofu-based variety. 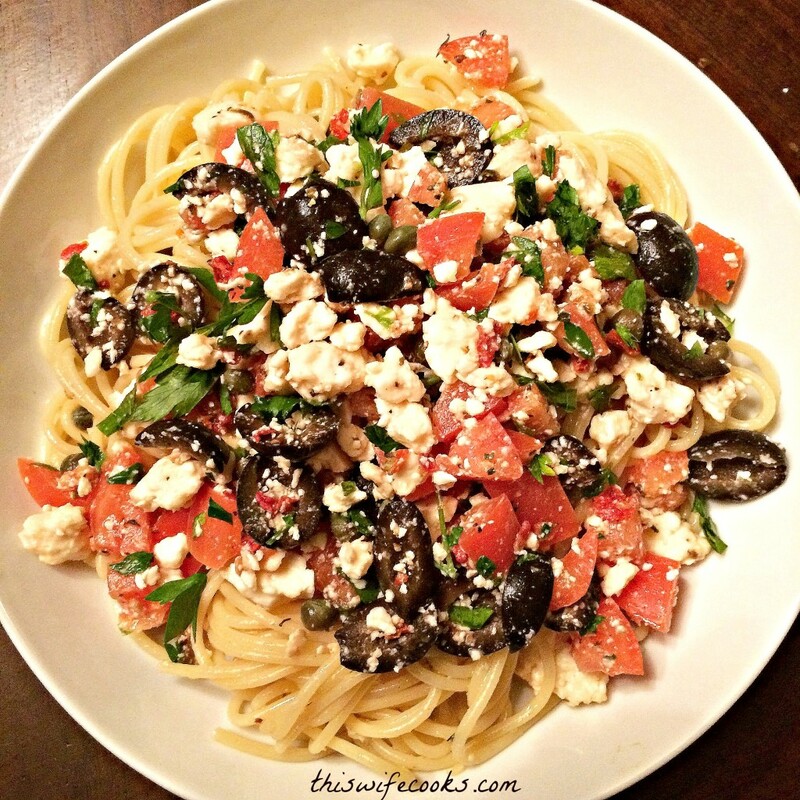 In a medium size mixing bowl, combine tomatoes, olives, feta, capers, and parsley. Season with black pepper, to taste, and set aside. In a large pot, cook spaghetti according to package directions. Drain well and return pasta to the pot. Meanwhile, in a small saucepan, heat olive oil over low heat. Add garlic and cook, stirring frequently, 1-3 minutes until soft and fragrant but not brown. Pour garlic oil over the pasta and toss to coat. Distribute pasta to serving bowls and top with desired amount of tomato and olive mixture.